Education: Self-taught, apprenticed as a printer. Honorary Doctor of Laws, Universities of Edinburgh and Oxford. Work: Printer, Publisher, Scientist. Clerk of the Pennsylvania Assembly, 1736; Founded the Library Company of Philadelphia, 1731; Postmaster of Philadelphia, 1737-1753; Member of Pennsylvania Assembly, 1751-1764; Deputy Postmaster general of the British colonies in America, 1753; Founded Academy of Sciences of Philadelphia, 1753; Agent to Europe for Pennsylvania, 1757-1762, for Pennsylvania, Georgia, New Jersey, Massachusetts, 1764-1775; Elected to Continental Congress, 1775; Testified before Parliament concerning the Stamp Act, 1776; Postmaster General of the united colonies, 1775; Commissioner to the French Court, 1776; Minister plenipotentiary to the French Court, 1779; Negotiator in and Member of the Treaties with Gr.-Britain, 1781-1783; Member of the Supreme Executive Council of Pennsylvania, President of Pennsylvania Society for the Abolition of Slavery, 1785; Senior member of the Constitutional Convention, 1787. Benjamin Franklin, born in Boston, Massachusetts, on January 17, 1706, may by his life alone be the most profound statement of what an American strives to be. With no formal education beyond the age of 10 years, Franklin was celebrated throughout Europe, welcomed in any Royal Court, sought out by every prestigious society. Indeed, when the reputations of George Washington and Thomas Jefferson had yet to be sorted out, Franklin was worshipped wherever his name was known. He attended grammar school at age eight, but was put to work at ten. He apprenticed as a printer to his brother James, who printed the New England Courant, at age twelve, and published his first article there, anonymously, in 1721. Young Benjamin was an avid reader, inquisitive and skeptical. Through his satirical articles, he poked fun at the people of Boston and soon wore out his welcome, both with his brother and with the city. He ran away to New York and then on to Philadelphia at the age of 16, looking for work as a printer. He managed a commission to Europe for the purpose of buying supplies to establish a new printing house in Philadelphia, but found himself abandoned when he stepped off ship. Through hard work and frugality he bought his fare back to Philadelphia in 1732 and set up shop as a printer. He was appointed clerk of the Pennsylvania Assembly in 1736, and as Postmaster the following year. In 1741 he began publishing Poor Richard’s Almanac, a very popular and influential magazine. He was elected to the Pennsylvania Assembly in 1751 and served as an agent for Pennsylvania (and ultimately for three other colonies) to England, France, and several other European powers. He was elected to the Continental Congress in 1775, where he played a crucial role in the rebellion against Gr. Britain, including service to Jefferson in editing the Declaration of Independence. 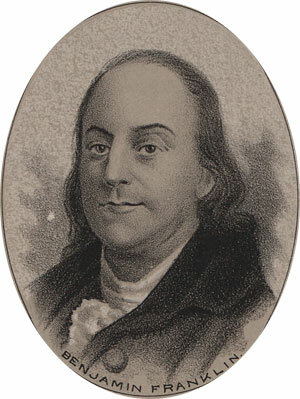 Franklin, who was by this time independently wealthy and retired from publishing, continued to serve an important role in government both local and national. He was the United States first Postmaster General, Minister to the French Court, Treaty agent and signer to the peace with Gr. Britain, Celebrated Member of the Constitutional convention (See Work, above). Benjamin Franklin: Businessman, Writer, Publisher, Scientist, Diplomat, Legislator, and Social activist, was one of the earliest and strongest advocates for the abolition of Slavery, and for the protection of the rights of American aboriginal peoples. He died on the 17th of April in 1790. On that day he was still one of the most celebrated characters in America. So should he always be.